The Lyra RSV + hMPV Assay is a multiplex real-time PCR assay for the qualitative detection and identification of respiratory syncytial virus (RSV) and human metapneumovirus (hMPV) viral RNA extracted from nasal swabs and nasopharyngeal swab specimens. This real time RSV + hMPV test detects RSV and hMPV and is able to differentiate between them. A multiplex real-time RT-PCR reaction is carried out under optimized conditions in a single tube generating amplicons for RSV, hMPV and the Process Control (PRC). Identification of RSV and hMPV and the PRC occurs by the use of target-specific primers and fluorescent-labeled probes that hybridize to conserved regions in the NS2 and polymerase genes of RSV and polymerase gene of hMPV and the PRC. The Lyra RSV + hMPV Assay has a one-step reagent set up. Test results are available in less than 75 minutes after extraction. 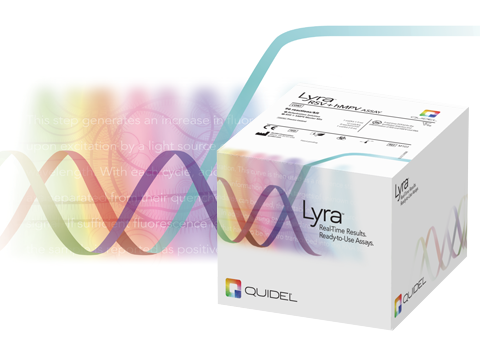 Lyra RSV + hMPV RT-PCR is available for use on the Applied Biosystems® 7500 Fast Dx, QuantStudioTM Dx Real-Time PCR Instrument and Cepheid® SmartCycler® II. The Lyra RSV + hMPV Assay is one in a growing menu of tests and intended to aid in the differential diagnosis of RSV and hMPV infections in humans. *Data for Applied Biosystems™ 7500 Fast Dx. Refer to Package Insert for additional performance claims. Also available through Life Technologies.